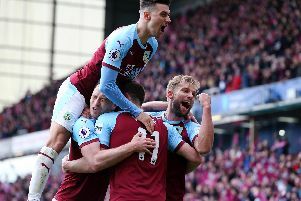 Sean Dyche felt a number of incidents went against his side as a controversial late Southampton equaliser denied Burnley a first win in 11 Premier League outings. Saints snatched a point through substitute Manolo Gabbiadini at the death as he turned and volleyed in from Josh Sims’ cross - after referee Bobby Madley blocked Ashley Westwood from getting to the ball ahead of Nathan Redmond, who set up the Southampton attack. Dyche felt Kevin Long was impeded by Gabbiadini for the goal as well, and felt there was a good shout for a penalty moments later as Ashley Barnes went to ground under a pull from Wesley Hoedt. Madley earlier missed Saints keeper Alex McCarthy carrying the ball outside the area under pressure from Aaron Lennon, and Dyche said: “It was another interesting afternoon let’s say. “Without being brilliant I thought we were solid, but you can only control the controllables and things out of ours went against us. Asked about the key incident, Dyche mused: “Which incident? The goalkeeper handled outside the box. Ashley Barnes was fouled for a penalty but fortunately jumps up and scores anyway. “Then there was the moment when the ref unfortunately gets hit with the ball that puts them on the counter. “Kevin Long was pulled back by the shirt when there wasn’t a lot in it to be honest, but everyone gets a free kick from them. “And Ashley Barnes was pulled down by a hand on his shoulder (off Wesley Hoedt). Burnley’s wait for a Premier League win goes on, but Dyche added: “I still think there is more to come. “Still think we are moulding the team. It was solid.